The month’s name derives from the Roman goddess Maia (dalla dea romana Maia), mother of Mercury, but in Christian culture (nella cultura cristiana) maggio is dedicated to the Madonna, the mother of Jesus. May in Italy also is known as il mese delle rose e delle spose (the month of the roses and the brides). Le rose (roses) blossom during May, a popular time for le nozze (weddings). May starts with il Primo Maggio (the first of May) and la festa del lavoro (the equivalent of America’s Labor Day) and includes a host of celebrations, including la festa della mamma (Mother’s Day). But Italians never stop keeping an eye on the weather (il tempo) during this unpredictable month. al canto del cucù (to the singing of the cuckoo). e le strade si riempion di risate (and the streets are filled with laughter). mentre i papà e le mamme si riposano (while the fathers and mothers rest). e nell'aria si respira tanto amore (and in the air you breathe so much love). Guarda in alto, alza gli occhi al cielo (Look up, lift your eyes to the sky). Di notte è pieno di stelle mentre di mattina il sole risplende. (At night it is full of stars while in the morning the sun shines). *Allora: It is one of my favorite words but it is difficult to explain its meaning. It means “well,” “so” or “then.” I love the way Italians use it ever so often in every sentence. *Arancione: This means the color orange. Love the way it feels when I speak it. *Chiacchierare: This word for chit-chat is just like it sounds--chatty and gossipy. *Menefreghismo: Ha! This word is badass. It describes an “I-couldn’t-care-less" attitude. *Ammazzacaffè: Literally coffee-killer. “Fun to say -- and drink. It can be considered the official end to a meal--often grappa, but it can also be something like strega, a digestive." *Aspirapolvere: Vacuum cleaner (literally "inhales dust"). *Farfanteria: Sicilian dialect for "a tissue of lies." It makes a horrible thing sound pretty! *Palloncino: Balloon (the kind kids play with). *Pettegolezzo: Gossip, from the root word gola (throat). *Pomodoro: Tomato, but literally “golden apple.” “This could help avoid all those tomahto/tomato arguments." *Tuffarsi: To dive … so onomatopoeic! 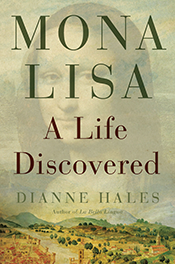 Dianne Hales is the author of LA BELLA LINGUA: My Love Affair with Italian, the World's Most Enchanting Language and MONA LISA: A Life Discovered. In future posts, I will be writing about some of my favorite Italian words. I'd love to hear any that you'd like to share. Founded in 753 B.C., Rome marks its 2,771st birthday on April 21. If you’re in the city this weekend, check out the special festivities, which typically include concerts, gladiator displays, a parade and fireworks. If I could be there, I’d head for the oldest part of Rome: the Palatine hill, named for the goddess Pales, patroness of shepherds—and the oldest part of Rome. When Rhea Silva gave birth to two boys of uncommon beauty and size, the angry monarch ordered them drowned. A slave placed them in a basket in the Tiber that washed ashore at the foot of what is now the Palatine Hill. According to legend, a lupa (she-wolf) suckled the twins Romulus and Remus. However, their nursemaid may well have been human since lupa was slang for prostitute. During ongoing excavations on the Palatine hill, archaeologists discovered what could be the original lupercale, the cave that sheltered the twins and that later served as a shrine for their worship. After the boys grew to maturity, they overthrew their evil uncle and decided to build a new town on the banks of the Tiber. In a violent argument, Romulus killed his brother Remus. Taking command, Romulus gave his name to the settlement that would grow into a great empire. Over the centuries the Palatine hill, with its tranquil setting and splendid views, attracted rich and powerful residents. Octavian, later adopted by Julius Caesar, was born on this sacred site in 63 B.C. When the Senate proclaimed him Augustus, Rome's first emperor, he built a house near the small structure known as Romulus's hut. His successors, the emperors Tiberius, Caligula and Claudius, lived in much grander homes atop the Palatine. Visitors to these mansions called them palazzi—the root of the word for "palatial" residences in French (palais), Spanish (palla) and English (palace). Who can resist this classic ode to Rome? Recently Tutorful, an online tutoring marketplace in the United Kingdom, surveyed some 60,000 Italian tutors, students and parents to identify the resources they felt benefited their Italian skills most on a day-to-day basis. After what the editors described as "a tough selection" to whittle down the recommendations, LA BELLA LINGUA has won a “Best Italian Resource” badge and inclusion on Tutorful’s official list. News in Slow Italian This app is designed specifically for intermediate learners and it's updated weekly so students can improve their Italian through current events. The news stories and conversations are read at a slower pace to improve comprehension, and the audio also includes a transcript with contextual translations. Besides news, the program offers grammar in context, idiomatic expressions, quizzes, pronunciation and live conversations. Duolingo This website was created so everyone everywhere can learn languages in the most efficient way for them. Probably the world's most popular language learning platform. Quick, intuitive and absolutely free! Online Italian Club A website for Italian language students looking for free learning materials. If you know your level already, click their handy links to go to a hub of useful resources, online lessons and pronunciation tips. Learn Italian with Lucrezia In her youtube videos Lucrezia always tries to be as clear as she possibly can and always uses language that she would use in her daily life. Grammar is hugely important, and she explores ways to learn it in interesting ways. Lucrezia keeps it fun and gives context to all her examples, so that students won’t shy away from it because they think it is too hard. Coffee Break Italian This is a fantastic way to maximize your downtime and learn Italian where and when it suits you. The course features structured lessons in which you'll join teacher Mark, native speaker Francesca and learner Katie; you'll be the "second learner." Coffee Break Italian features audio, video and text materials and is perfect for beginners through intermediate students. Rick's Rome Rick Zullo’s podcast topics range from useful pronunciation advice and general language tips to dating in Italy and Italian superstitions. An all-round fabulous talk show with just the right amount of humour and cultural insight. Ciao Citalia Join Romina and Clive as they take you on the journey to fluent Italian! A great evening listen if you've got an upcoming holiday booked to the romantic country with everything from restaurant language tips to survival phrases! Studentessa Matta This blog promotes the study of Italian language and culture through dual-language posts. On the site, you will find lots of free ways to practice and improve your Italian skills, as well as encouragement, inspiration and insight about language learning and traveling in Italy based on personal and unique experiences. Bleeding Espresso Michelle started Bleeding Espresso to keep in touch with family and friends as well as to build up a freelance writing business. In the years since it began, the blog has become a wonderful source of insight into Italian life in the medieval hilltop village of Badolato. You'll also find interesting books, recipes and traditions -- the perfect companion to your Italian language lessons. Italian Grammar (Barron's Grammar) Our favourite fast-reference Italian grammar guide. Whether you're a student or a translator, this book offers pocket-sized language knowledge when you really need it. 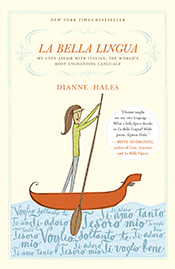 Since its publication in 2009, La Bella Lingua has become a New York Times best-seller as well as a highly recommended resource by various associations of Italian teachers. 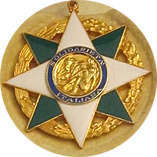 The reason is that it offers a unique combination of an accurate history and depiction of the language and an engaging writing style. The book has motivated hundreds of people studying Italian to learn the language, provides insights into Italian culture and adds to their enjoyment of Italy and Italian. I advise sampling different types of learning resources. You’re sure to find some that will deepen your understanding and enthusiasm for Italian--and enjoy yourself along the way. This is the time, as a Roman friend once told me, when la voglia di vivere (the love of life) takes precedence sui doveri (over duties).Whatever you love best about this lovely month, I hope you enjoy every moment to the fullest. *La neve di gennaio diventa sale, e quella d'aprile farina -- January's snow becomes salt, April's flour. *La nebbia di marzo non fa male, ma quella d'aprile toglie il pane e il vino -- The fog of March doesn't hurt, but that of April takes the bread and wine. *Aprile una goccia o un fontanile -- April brings a drop (of rain) or a flood. *D'aprile piove per gli uomini e di maggio per le bestie -- In April it rains for men and in May for animals. *April, apriletto, un dì freddo un dì caldetto -- April, little April, a cold day, a warm day. *Aprile fa il fiore e maggio si ha il colore -- April makes the flower and May has the color. *Aprile piovoso, maggio ventoso, anno fruttuoso -- Rainy April, windy May, fruitful year. *Aprile e conti per lo più son traditori -- April and bills for the most part are traitors. *Gli uomini sono aprile quando fanno all'amore, dicembre quando hanno sposato -- Men are April when they make love, December when they've married.